With nearly 2.5 million fans, Vodafone Zoozoos is one popular Facebook Brand page! And, why not? It is one of the most popular campaigns with characters that connect, that we have seen in India. 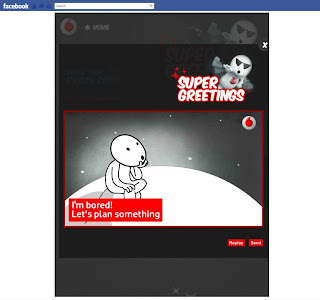 The latest on brand page are ‘Super Greetings’ Zoozoo e-cards that Vodafone has been promoting. The Zoozoos and the shorts around them lend themselves to viral so this is a good extension. There are three categories of cards in the application - Birthday, Thank You, Crazy - with a few options in each category (the most in Birthday). These are animated cards that you can preview, add a message and send out to friends on Facebook. Choosing friends on the Birthday Card was tedious as all your friends appear on a filmstrip from which you need to choose. I prefer the Facebook Send Request integration for Thank You and Crazy cards. But I don’t understand why they would have different flows for different categories. You can't fault the e-cards though. Adorable! Not sure if they have these cards on the Vodafone website and on mobile. They should.